July 4 weekend has come to a close, but grilling season is still in full swing! You may recall from my Homemade Grilled Bread post that at a recent Cooking Club (Hostess: AWP; Theme: Grilling; Date: 06.09.13), I tried my hand at making fresh bread dough – and grilling it. The bread was delicious – my guess is it was the sour cream that made it so special. With toppings, the resulting flatbreads would make a memorable appetizer … or even main course, if you can resist not throwing a steak on the grill. Each of the 8 portions from the Homemade Grilled Bread recipe will make a flatbread that is about 6″ in diameter, give or take. The original recipe indicates that the dough should be rolled to 1/4″ thick – mine was so elastic that I could not get mine anywhere near that thin. If you manage to, your flatbread will be much larger than 6″ round. I like my dough a little thicker though. 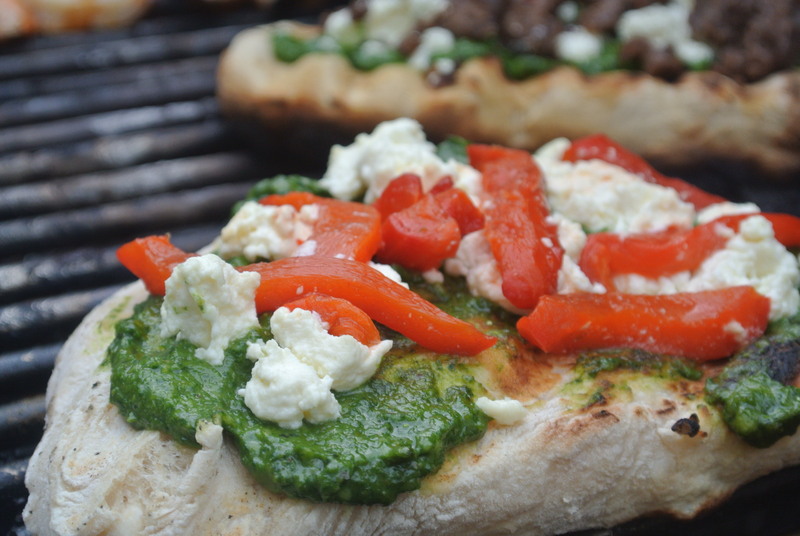 If you are hosting a gathering, having a family picnic in the backyard, or, like me, just want some variety, set out a number of prepared toppings (cooked, if necessary, like for sausage or tough vegetables), allow your guests to select which they want on their flatbread, and assemble fresh on the spot. The leftover toppings will be perfect to add to an egg scramble or egg muffin cup in the morning, or a pasta toss – so don’t skimp on the selection! – toppings! … Here are some ideas: Pictured above are pesto, Fresh Ricotta Cheese, Roasted Red Peppers, and sweet Italian bison sausage (in the background). Other choices: sweet onions sauteed with balsamic vinegar, sauteed sliced portabello or cremini mushrooms, sauteed spinach, and fresh mozzarella. Heat a gas grill to high. Brush grill rack with oil. 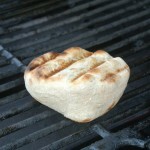 Grill dough until lightly charred on one side and no longer sticking to grill, 2–3 minutes. It may help you to close the lid while you are cooking. 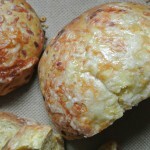 Using a spatula, flip dough and grill until cooked through, 1–2 minutes longer. Add toppings, sauce or spread first (then cheese and vegetables, depending how you like it). Cook until toppings are heated through, 2-3 minutes; place on the top rack of the grill to cook the inside with indirect heat if the dough is cooking too fast and starting to burn (in a bad way). -OR- Heat your oven to 450. Place the dough on a floured heavy baking sheet, and cook until browned (about 10 minutes). Flip, and repeat (it will be less time for the second side). Add toppings, sauce or spread first (then cheese and vegetables, depending how you like it). Cook until toppings are heated through, 5 minutes or less. Because the heat is indirect in the oven, you should not have to worry about the dough burning before the toppings are heated through. I recommend serving in stick-shaped slices. Cut by placing the completed flatbread on a large cutting board and slicing into strips, with a chef’s knife or santuko knife, pressing down firmly in one motion rather than sawing or using a pizza cutter (and risking the toppings falling off). We made this on the grill tonight – SO good. We used gluten free flour (cup4cup) with no trouble. I added a tiny bit of sugar to the bread recipe, but otherwise kept it the same. Topped some with leftover steak, bleu cheese, and grilled onions. The kids had them topped with mozzarella, cheese, and italian sausage. My favorite was topped with peaches, red onion, and bleu cheese. We all enjoyed them!